Dairy Crest, Chadwell Heath, Dagenham, UK. Dairy Crest is among the top dairy brands in the UK with sites throughout England and a reported annual turnover in excess of £1.3 Billion. The Dairy Crest Group plc also own MH Foods the successful cooking oils company and other related businesses. Dairy Crest own the No.1 cheese brand Cathedral City, Country Life & Clover butter and FRijj flavoured milk. At the Chadwell Heath plant Dairy Crest have a highly utilised, state of the art flavoured milk packaging facility and process more than 400 million litres of milk per year. A number of formats are produced including 1L cylindrical PET. In addition to packaging their own high quality flavoured milk products they also pack for several of the leading super market chains. The particular challenge faced was to lane and shrinkwrap the soft square 1L PET bottles. Dairy Crest had an aging sealing bar shrinkwrapper with an intermittent laning device. The soft bottles proved difficult to handle due to their ‘squeezability’. Enterprise Tondelli was chosen to supply a robust and effective solution. Enterprise provided a 35 pack per minute Baumer shrink wrapping system complete with a revolutionary continuous motion laning system. This patented system comprises an infeed section where trains of bottles are collated which are then fed into a driven rotating angled disk with translation paddles. The whole system is driven by several servo motors. 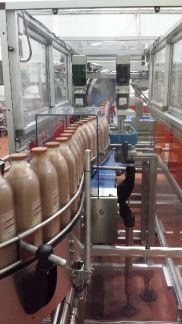 The infeed has an ‘auto-regulation’ system to cater for a flow of enlarged bottles; whereby the infeed section sensors measure the actual bottle size and adjusts the infeed operation accordingly. The system handles the soft bottles perfectly without any of the traditional problems associated with soft bottles. Baumer have experience in producing machines for the demanding dairy environment. However with close cooperation with the Dairy Crest engineers an even better machine has been developed. The machine has a very high content of stainless steel in its construction which allows for excellent clean-ability and hygiene. General cleaning regimes include the use of caustic which is very aggressive toward aluminium and to a lesser degree painted steel. Therefore great care was taken to eliminate these materials from the bottle level down. The wrapping machine is of the overwrap type without sealing bar. Access for maintenance and cleaning is excellent due to the full height sliding doors. The heart of the machine ie . the cutting section is mounted on a manually retractable assembly making maintenance very straightforward. The machine is driven through a series of servo motor drives thus reducing maintenance and also allowing for rapid change overs and swift re-synchronisation. 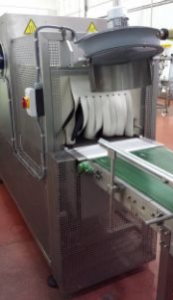 Enterprise Tondelli provided a turnkey solution complete with hygienically designed conveyors, cable management system and integrated controls. Steve Cottam – Dairy Crest Chief Engineer stated “We are very satisfied with the Enterprise solution. They have provided a system which has dramatically improved our efficiencies with no wastage. The installation and commission was planned and implemented without flaw. In fact the ramp up was the fastest and most trouble free I’ve ever seen in this type of production environment”. Garry Wilson, Enterprise Tondelli PM commented that this was the result of excellent cooperation, advance planning and communication between Dairy Crest and our teams. In addition there was a requirement to install within a very narrow time frame. Apparently “The cows cannot wait”. Enterprise Tondelli are proud to be associated with such a successful project and look forward to working again with Dairy Crest. Enterprise Tondelli with their partners Baumer supply shrinkwrapping solutions with machines operating up to 200 cycles per minute for stable products (in triple lane configuration equals 600ppm) and up to 80 packs per minute in wrap-around carton format.